For the language, see Cotabato Manobo language. The Tasaday people in their homeland, the last primal rainforest of Mindanao. The Tasaday (tɑˈsɑdɑj) are an indigenous people of the Philippine island of Mindanao. They are considered to belong to the Lumad group, along with the other indigenous groups on the island. They attracted widespread media attention in 1971, when a journalist of the Manila Associated Press bureau chief reported their discovery, amid apparent "Stone Age" technology and in complete isolation from the rest of Philippine society. 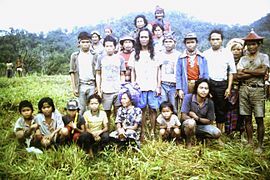 They again attracted attention in the 1980s when some accused the Tasaday living in the jungle and speaking in their dialect as being part of an elaborate hoax, and doubt was raised about their isolation and even about being a separate ethnic group. Further research has tended to support their being a tribe that was isolated until 1971 and that lived as nomadic hunter-gatherers. The Tasaday language is distinct from that of neighbouring tribes, and linguists believe it probably split from the adjacent Manobo languages 200 years ago. Manuel Elizalde was the head of PANAMIN, the Philippine government agency created in 1968 to protect the interests of cultural minorities. He was the son of a wealthy father of Spanish lineage and an American mother. He was a known crony of the late Philippine dictator Marcos. He took credit for discovering the Tasaday, which he did on June 7, 1971, shortly after a local barefoot Blit hunter told him of a sporadic contact over the years with a handful of primitive forest dwellers. He released this to the media a month later, and many excited people began the long task of clearing the thickest forest in the world. Weeks later, visitors' way was blocked by PANAMIN guards who answered to Elizalde alone and allowed only a select group of the visitors to meet them. Tasadays riding on a motorbike. Elizalde brought the Tasaday to the attention of PANAMIN, which funded all efforts to find, visit, and study the Tasaday. With a small group including Elizalde's bodyguard, helicopter pilot, a doctor, a 19-year-old Yale student named Edith Terry, and local tribesmen for interpreting attempts, Elizalde met the Tasaday in an arranged clearing at the edge of the forest in June 1971. In March 1972, another meeting occurred between the Tasaday, Elizalde, and members of the press and media including the Associated Press and the National Geographic Society, this time at the Tasaday's secluded cave home site. This meeting was popularly reported by Kenneth MacLeish in the August 1972 issue of National Geographic, which featured on its cover a photograph by photojournalist John Launois of a Tasaday boy climbing vines. Since these first meetings and reports, the group was subject to a great deal of further publicity, including a National Geographic documentary, "The Last Tribes of Mindanao" (shown December 1, 1972). Visitors included Charles A. Lindbergh and Gina Lollobrigida. In April 1972, Philippine President Ferdinand Marcos (at the behest of PANAMIN and Lindbergh) declared 19,000 acres (182 km²) of land surrounding the Tasaday's ancestral caves as the Tasaday/Manobo Blit Preserve. By this time, eleven anthropologists had studied the Tasaday in the field, but none for more than six weeks, and in 1976, Marcos closed the preserve to all visitors. The reason for the ban was the martial law the country was under; outsiders were not welcome because that put the Marcos regime under more scrutiny. In 1983, some time after the assassination of Philippine opposition political leader Benigno Aquino, Jr., Elizalde fled the Philippines. It had been rumoured that he fled with and eventually squandered millions of dollars from a foundation set up to protect the Tasaday. Elizalde returned to the Philippines in 1987 and stayed until his death on May 3, 1997, of leukaemia. During this time, from 1987 to 1990, Elizalde claimed he'd spent more than one million U.S. dollars of Tasaday non-profit funds. During this time, Elizalde also founded the Tasaday Community Care Foundation, or TCCF. After President Marcos was deposed in 1986, Swiss anthropologist and journalist Oswald Iten, accompanied by Joey Lozano (a journalist from South Cotabato) and Datu Galang Tikaw (a member of the T'boli tribe to serve as chief translator, though he did not speak Tasaday), made an unauthorised visit to the Tasaday caves where they spent about two hours with six Tasaday. Upon returning from the forest, Iten and Lozano reported the caves deserted and further claimed the Tasaday were simply members of known local tribes who put on the appearance of living a Stone Age lifestyle under pressure from Elizalde. Many local tribesmen admitted to pretending to be Tasaday in order to gain funds, reputation, and other items. In the mid-1990s, Professor Lawrence A. Reid (U. of Hawaiʻi, Dept. of Linguistics, Emeritus) wrote that he spent 10 months with the Tasaday and surrounding linguistic groups (1993–1996) and has concluded that they "probably were as isolated as they claim, that they were indeed unfamiliar with agriculture, that their language was a different dialect from that spoken by the closest neighbouring group, and that there was no hoax perpetrated by the original group that reported their existence." In his paper 'Linguistic Archaeology: Tracking down the Tasaday Language', Reid states that, although he originally thought that an individual Tasaday named Belayem was fabricating words, after a detailed analysis of the linguistic evidence he found that around 300 of Belayem's forms were actually used in Manobo languages of Kulaman Valley, a place Belayem had never visited. He also mentions that a similar group was later found and confirmed to be living as hunter-gatherers without contact to other tribes. The Tasaday were likely a separate group living as gatherers deep in the jungle, who were rarely in contact or trade with the neighbouring people, but probably were not a Stone Age culture. ^ DUMONT, JEAN PAUL. 1988. "The Tasaday, Which and Whose, Toward the Political Economy of an Ethnographic Sign." Cultural Anthropology3 : 261-75. ^ Molony, Carol H. 1992. "The Tasaday language: Evidence for authenticity?." In Thomas N. Headland (ed. ), The Tasaday controversy: Assessing the evidence, 107-16. American Anthropological Association Scholarly Series, 28. Washington, D.C.: American Anthropological Association. ^ Reid, Lawrence A. "Another Look at the Language of the Tasaday" (PDF). Retrieved 12 June 2011. ^ Reid, Lawrence A. 1992. "The Tasaday language: a key to Tasaday prehistory." In Thomas N. Headland (ed. ), The Tasaday controversy: Assessing the evidence, 180-93. American Anthropological Association Scholarly Series, 28. Washington, D.C.: American Anthropological Association. ^ ITEN, OSWALD. 1986. "Die Tasaday: Ein Philippinischer Steinzeitschwindel." Neue Zurcher Zeitung. Zurich, April 12: 77-89. ^ "BBC – h2g2 – The Tasaday Hoax – A726653". Archived from the original on 2011-07-05. Retrieved 2010-12-26. ^ LINGUISTIC ARCHAEOLOGY: TRACKING DOWN THE TASADAY LANGUAGE Archived 2011-06-14 at the Wayback Machine. 1994. Paper presented to the World Archaeology Congress – 3: Language, Anthropology and Archaeology, New Delhi, Dec. 4-11. Wikimedia Commons has media related to Tasaday. This page was last edited on 9 March 2019, at 04:36 (UTC).